I signed up for a portfolio review next month, and I asked my readers here and my friends on Facebook to help me whittle down nearly 300 of my recent photos (since I bought a DSLR in 2009) into a top 20. The crowd-selected favorites are here, and I thought I'd share the story behind each of the photos, starting from the lowest-vote getter up to the top vote getter (which surprised me!). 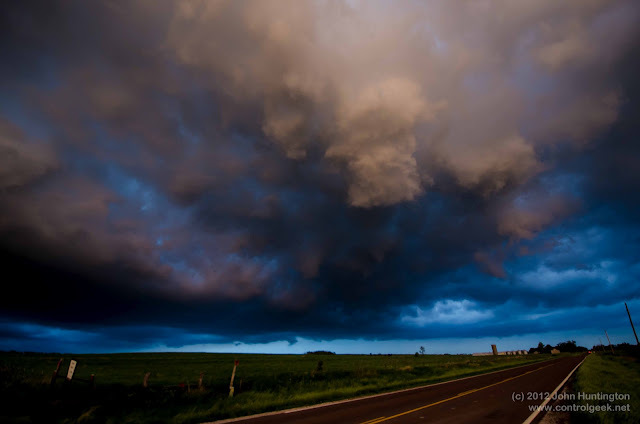 In May of 2012, I was storm chasing in the plains while on sabbatical from City Tech, and was in a severe thunderstorm watch area in Kansas south of Topeka. I watched one storm pop on the radar 100 miles or so away to the south west, and started blasting towards it. I had to make a snap navigation decision and learned the hard way that the Kansas Turnpike has exits only like 30 miles apart in the Flint Hills area! I headed about 20 miles farther southwest than I needed to, watching on radar as the storm grew and got a severe warning. I then finally reached the next turnpike exit, and looped back north, got on the updraft south of Cottonwood Falls as this hook-shaped monster transitioned back into a roadless area. I got north and east around the back and the top of the storm (no roads where I needed to go!) and then core punched this storm's formerly-severe, northerly cousin and emerged into the updraft to see this view, which literally took my breath away. It was one of the most amazing things I've ever seen, and I hung around in here as long as I could, taking photos.I was in there pretty much all alone, and two local volunteer fireman came up and asked me what I thought of the storm! I'm from Brooklyn, I told them. But I had lots of radar data to share with them, and then the storm chased me all the way to northeastern Oklahoma where I had a room for the night. More photos and writeup on this storm here.